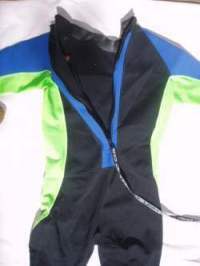 Now that you bought a scuba diving wet suit you need to get it on since you want to be warm and toasty during your dive. To make it as hassle free as possible, I'll give you tips on how to put on a wetsuit so you'll look like a pro on the dive boat. Alright, on with the show. Unfortunately, wetsuits do not fit like clothes. For it to work properly, a scuba diving wet suit should essentially make contact with your whole body. It also does not slide on easily, like our clothes, so it can be a challenge to make sure it is put on properly. And it needs to be on properly to ensure you have the right size if you are buying a wetsuit. I have seen people pull out shampoo and wet the inside of their wetsuit to make it go on easier. Never tried this one myself. It does make the boat slippery so use with care if you try this. Here are some simple steps so you know how to put on a scuba diving wet suit properly. Put both legs in and pull the suit up over your thighs. (Note: If you help your heel in by pulling out the bottom of the leg (you should be sitting to do this) it will put less strain on your seams). Pull on the shin area to adjust the ankle area. Pull on the knee area to adjust the shin area. Pull on the thigh area to adjust the knees. Basically you are working out each roll as you move up. Pull up on the thigh area up to your crotch. This is where most of the problems arise. If the wetsuit isn't pulled snug enough into the crotch, it will feel too short and the wetsuit will pull at your shoulders. So make that wetsuit nice and snug at the crotch. An essential step in how to put on a wetsuit properly. Work the arms in the same way as you did your legs. Gently pull the suit up your arms and then lift it onto your chest. The armpit should also be like the crotch area, nice and snug to give you more range of movement and comfort. While most wetsuits have a long string to pull the zipper up the back, it's best to have a buddy do this. It will avoid some stress on the zipper and prevent the zipper from catching on the neoprene, a common occurrence. Secure the velcro fastening so the zipper doesn't come undone. One minor detail if this is your first time putting on a scuba diving wet suit, the zipper goes in the back (for the vast majority of wetsuits anyway - some two piece suits have a front zipper). One tell tale sign, if it has a long string attached, the zipper goes in the back. The string is to help you zipper the wetsuit by yourself. So there you have it, how to put on a wetsuit properly is easy, isn't it?. So get out there, get a wetsuit and have fun!